loved the book………….and I thought my father was strict! Wonderful book. Such an interesting life. I could live in that house. Thank you so much Plum Johnson. I just finished your book and thoroughly enjoyed every minute of it. You are a lovely writer and describe such a wonderful family life with all its ups and downs on the beautiful shores of Lake Ontario. Just finished your wonderful book…it made me laugh and cry. Thank you for sharing your story. I will be passing it on to my sisters and friends. Am reading your memoir. My brother was your furniture appraiser( the one you liked), what an absolutely wonderful account of your family…written with such warmth, humour and a softness of heart through it all. It made me cry and made me laugh out loud……I do hope it brings you comfort and joy to have written this….I just love it! I read this book non-stop under piles of blankets on the sleeping porch of my late parents’ house of 50 years. I am in the process of sorting, emptying and selling it while finally turning (I hope) into an actual adult. By thoughtfully providing me with this book with such excellent timing, Plum Johnson has joined a precious group of my friends who have helped me through this shockingly profound and disorienting process, which she describes so flawlessly that I could finish her sentences as I read. So to Plum, I am extremely grateful for the company, support, insight and optimism of your words. Thank you thank you thank you. Congratulations on making the Taylor Prize short list. I just spent two weeks pre-decluttinering at my 80 year old mum’s condo. Can’t wait to read They Left Us Everything now that it’s hit my radar. Thank you for “They Left Us Everything.” It’s said that what you need, finds you. I needed your book at this point in my life. I have just finished clearing my mom’s apartment as she is now in a care facility. In 2003, we cleared the family home and many of the family history letters and papers that needed to be sorted, moved to her apartment. “I need to sort this stuff” was my mom’s mantra but now it has come to reside at my apartment. Reading your book has given me the courage I needed to start on my own ‘sorting’ journey. I have just purchased 4 copies of your book to give as gifts to my daughter, daughter in law, friends for thier daughters! It really made an impact on me-I was not there to look after my aging mother and father – and the guilt is with me still – no matter what anyone tries to tell you, it matters that we care for those we love as best we can and you did that in spades! You have written with humour and insight, brava for sharing those details of family life and taking the time to discover your parents history. Thank you for sharing your gift. So many memories and connections for me growing up in Halton and now live in B.C. Until I read it, I thought that I should de clutter my place before I die or else my kids would hate me forever. Happy to feel differently now that I have read it. Thank you for addressing issues we all might experience….sooner or later. I agree.I will not purge so much as planned My kids will be able to find out who I really am when I m gone!! I walk a baby in Oakville once a week. I have been walking by your homestead and wondering about it!!! Last week I looked closer and knew I had found Point O View. I was full of emotion. I paid my respects to your dear brother and your fabulous parents! What a beautifully written memoir. I could not put this book down. It will become one of my favorite books…along with Glass Castles by Jeanette Walls. Congratulations on winning the Taylor Prize. I have lived in Oakville 55+years so many of your experiences in Oakville as a small Town are known (and dear) to me as well as the contraversial issues surrounding your parents legacy. I too was a daughter and caregiver to elderly parents and parents in law and do thank you for sharing your story which means a great deal to any family member who has to take on such a responsibility. Keeping family close to your heart, sharing experiences and giving love as much as possible while living seems to me the main lesson to take away from this wonderful book. Such a lovely warm read that made me laugh and cry. I loved visiting with your family and missed them when I finished your book. Congratulations on the Taylor Prize!! thank you for a fantastic read, I have had the task of clearing 2 homes (parents & inlaws) holding on to many family treasures, now my kids will have the task of sorting through 3 generations, hope they appreciate it as much as you & your siblings. Congratulations on winning the RBC award. I just finished your book. It was just wonderful. Congratulations on the RBC Award. Very well deserved. I cannot put into words what reading your book has meant to me. I have been struggling with the death of my parents for quite some time. They passed away 2weeks apart well into their 80’s. Very thankful for everything they gave us. Wow. What a beautiful journey of your life in words, Plum. I was transfixed by your story of your home and family. I am a convert now! I’ll promise to think twice about rushing and purging the memories of my parents’ and in-laws’ house. Thank you for the many threads of clarity you have given me! I loved every word. Thank you for sharing your family with us and thank you for writing such a beautiful book. It made me laugh it made me cry and it made me think about the past and the future. It is a rare thing for me to have a book captivate and resonate with me as strongly as this one did. I borrowed a copy (which I read in one sitting), but will order my own so that I can go back to it as needed. I delighted in the flow of your words, laughed and cried at your memories (which triggered my own – my dad said the very same thing about penicillin and mouldy bread! ), and your insights. Despite different backgrounds, there are so many similarities that I could have been reading my own memoir. My own parents (both immigrants to Canada) clashed frequently throughout their 54 year marriage; I have 3 younger brothers (one passed away at age 41); we grew up on the shores of a lake; and so on. Congratulations on winning the RBC Taylor Prize – very well deserved. It is a powerful work. Your book was captivating. What a wonderful legacy you have given to your family to pass down through the years. I couldn’t put it down! Loved your memoir, the stories and the title says it all! Thanks for sharing. Thank you for this beautiful book: thank you for allowing me to enter your family and get to know your parents and brothers and you, and inhabit that wonderful house so full of life. I felt a real pang of nostalgia as I turned the last page. Man, I just adored this book. I used to work at the local library, and ordered lots of books before I quit, including this one. When it arrived and I got the robot message it was awaiting me, just another patron, I almost didn’t borrow it, feeling I ordered it for others to read, not or my own life … Yet I did go ahead and borrow it. I have an incomplete song called or themed “Nostalgia for Nothing” (I spend a lot of time reading about English ‘cottages’ or famous Canadian authors’ creative spots such as Al Purdy’s cabin), and it wonders how others’ lives and walls can still echo in my own life… but they can and do. Our own past houses are never so grand and are long fallen out of our possession, and nor did we have any amazing antiques. But we did find surprises when dad died and there are innumerable other similarities. A really pleasing read and even the rag-paper feel (albeit on a glue-bound book) complemented the text. Well done! Man I just whizzed through this book. It was great and my family can totally relate. Keep up the good work. And I have a recommendation: The Illuminations by Andrew O’Hagan. 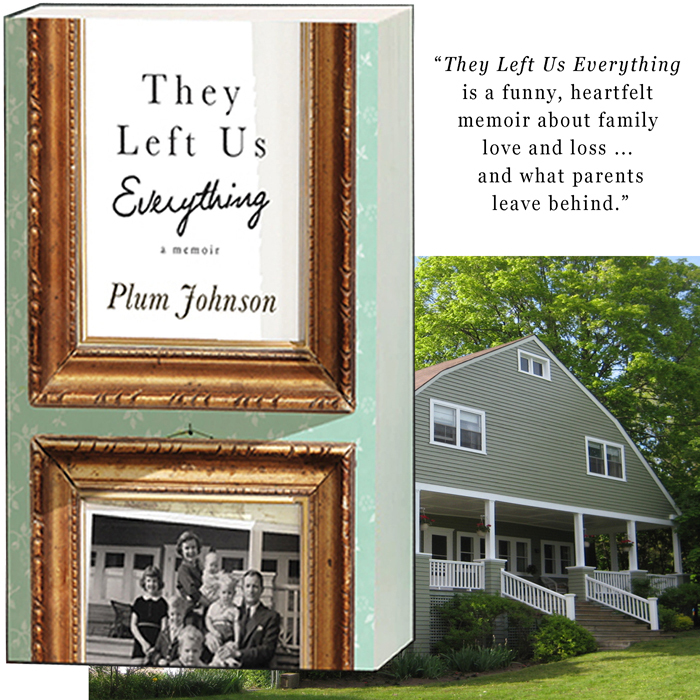 Hello Plum, I just finished reading They Left Us Everything and thoroughly enjoyed it. Your story is heartwarming and very interesting. I was happy to get an insight into your family life. It was a book that I did not want to finish reading because parts of it made me laugh and parts of it made me feel a bit sad, but finish it I did and delighted to have read it. Congratulations on a wonderful book! Thank you Plum for writing such an interesting memoir,They Left Us Everything. I heard your interview on CBC radio awhile back and knew I had to read your book. I requested your book with my local library and through interlibrary loads, it finally became available to me a couple of weeks ago. I read the book twice, this past week – hated to put it down. I want my adult children to read it and I will no longer worry about what I am leaving behind when the day comes that I pass from this world. What a privilege to learn more about our loved ones through their wealth of history. I have many long letters from my maternal grandmother from over 40 years ago that I cherish. She was my window to what my Mother was like in her younger years. Please keep writing. You are an amazing author. Just completed reading your heartwarming, sad and happy, book ‘They Left Us Everything’. I am presently decluttering and offering our home for sale after 47+ years and two children. My husband passed away over 5 years ago and it is time for me to move on. I was able to relate to many of your ups and down, emotions all over the place (at times thinking you are going crazy) and many of the wonderful happy moments as well. You have shared some very personal happy and sad times and I thank you for doing that; I am sure it was, at times, hard to do and yet I am sure it was also a way to release a lot of pent up emotions from years and years of growing up. Thank you for writing this profound book. I laughed, I cried but I could not put it down. I so related to everything in this great book. If I come across you reading at any location close to where I am, I will surely be out to that event. You are your mother and for that I am sure you are grateful. Thank you again. Loved the book and your family, flaws and all, and appreciate your honesty about the trials and tribulations of family life… could definitely relate. I used to live in Oakville and walked by your house at least 5-6X a week. So wonderful now to know its story due to your generosity and talent in sharing it with us. Great book and thank you, Plum! Friday evening I walked into the bookstore. I was drawn to your book as if by some unexplained force or magnetism. I purchased your book and began reading Saturday morning, and read non-stop. Thank you for sharing your thoughts, memories, and wonderful family history. With aging parents, I am approaching this next phase in life, knowing that “life as I know it now, will never be the same.” Thank you for sharing your ability to work, see, live, and move through these phases of your life. When I fell caught or trapped, I will remember to look up at the clouds and witness their movement and constant change. Thank you Plum! I’ve just been on a journey remembering my wonderful mother while reading about yours. Laughed and cried also and especially loved the part about your Mom wanting to shop and what a job it was to get Mom into the mall, get her seated by the door, go to the wheel chair kiosk, leave your keys as collateral, take Mom shopping so that she could look and feel everything in The Bay and then reverse the whole procedure — what a workout! Thank you for sharing and I’ll be giving your book to many friends who have/or are going to be going through the same themselves. Hello, I just this minute completed the book. I loved it! I lost my Mom 7 years ago and my father this past March. We are in the process of going through the house, splitting items between siblings and wondering what the heck to do with the rest! 🙂 I found many similarities to what you have gone through. The closer it gets to putting up the For Sale sign on the front lawn, the more I become attached to a home that meant nothing to me 6 months ago. Thank you for letting me know it will be ok.
You do feel “dear” to me after sharing so much of yourself in “They Left…”. I read it in about 36 hours, here at our retreat at Lake Torment, Nova Scotia. I woke up the morning of the day we left with brain fog from too much wheat, not to mention sweets and alcohol. “They Left…” was perfect. It had just arrived from a friend who visited just before our busy two weeks and she could see the parallels. Her similar farmhouse/cottage was recently sold. You’ve touched our hearts and souls. In her enclosed long handwritten letter, Carol wrote: I bought several copies & gave all away (to my brother too) and I’m sending this slightly battered copy. I think you’d like it – parts of it remind me of your cottage – still intact – and of you & your brothers. I, too, was born in 1946. I’m the youngest with three brothers, one of whom died in 2009 at 71. I too plan to buy several copies to give away. My husband wants to read my copy. Thanks again, Plum You’ve written a treasure. I look forward to reading it again, more slowly. I just finished reading your book, “They left us Everything.” I enjoyed it so much. I first read your article in The Toronto Life Magazine last year. Then a friend of mine just recently recommended that I read your book. I’m glad she did. I couldn’t put it down. I could identify with so many things that you wrote about. I want my adult daughter to read it. In 2013 my brothers and I had to clear my parents house which they lived in for more than 60 years. It was a daunting task and I can certainly relate to what you went through. A friend of mine recommended your book to me after we got to talking about our parents. I am so glad she did but wish I had read it before the last of my parents passed away in 2009. Unfortunately I let my younger brother ‘take over’ the cleaning out of my Mother’s apartment and some things were simply tossed out. Some things had no memory to him but they did to me. I now understand a lot about my Mother from your writing which has helped me. Thank you. Just finished your great book. Can’t wait for my sister to read it because we cleared out our parents’ house in 2005 with lots of laughter and tears, and exhaustion. What seems so daunting at first becomes a privilege, not everyone is chosen to receive. Currently I am goi g through my own papers, writing out information about my treasures which I hope will guide my family and trustees but perhaps I will now leave more to mystery. Like the readers before me – thank you for writing such a beautiful book. So many of us ‘baby boomers’ are now in the midst of decluttering our parents’ belongings. Many of us are sons and daughters of immigrants to Canada and, like myself, are discovering new stories never told through their old letters and photos. Like you said – not many people today receive letters – what a shame – so much history contained in them. My mom is 93, I plan to ask her a lot of questions before she departs. Thank You! I have just finished your beautifully written memoir, and it was such a gift. I laughed out loud, teared up, and stopped to re-read so many paragraphs because they resonated so deeply, or were so wise and so poetically expressed. Thank you for writing this book. Wow, I couldn’t put your book down. I too just lost my Mother this January, and we had to clean out her house and sell it, it closed the end of July this year. I can’t tell you how many times your book had me in tears. I just ordered this book on line (This is the Library’s Book that I just read) to give to my Twin sister on our Birthday this year. It will be the first birthday without my Mother calling us. I know that she will love it and cry reading, as I did. Thank you, thank you, thank you for writing such a wonderful book. I just finished your book and loved it! The circumstances are very familiar. My dad passed away about 3 years ago and my depression-era ma moved from our home in Toronto to be closer to me in Barrie instead of my brother in Kitchener because he stated very early on that he didn’t plan on staying in Kitchener so moving close to him would leave her alone fairly soon. Now I am tasked with the ongoing care of my increasingly crusty mother who seems bitter at being left behind and driving most of her family away.. I have never enjoyed a close relationship with my mother which makes my task now even more difficult. I miss my dad and wish he had survived my mother as we had a better relationship. Thank you so much for writing this memoir. I cried my heart out. Thank you for sharing your heart and soul in this wonderful memoir. It allowed me to connect with my own feelings of loss and grief. Beautifully written. I do hope you plan to write more books, you are a gifted writer! I just finished your book and really enjoyed reading it – right through to the end. My wife Maggie, passed it along to me to read and I have now passed it along to my sister as well as recommending it to my other siblings. In fact we have already arranged to have our first ‘sibling supper’ next month. There were so many aspects of your family’s story that resonated with me, bringing back memories from our youth. Our father passed away 4 years ago and our mom (91 yrs) still lives alone in the big family home along with a generation+ of artifacts, memories, etc. Your memoir has helped cast a positive light on the remaining years with mom and provided options for not only enduring what lies ahead but possible ways of making the next few years more enriching for everyone – thanks so much for sharing your story! I have never wrote to an author before but this seems like a really perfekt First time. I am Danish. My parents didnt live a life like your parents did. I have not dared What you dare. But still your book Gets to me in so many ways. My parents are not Dead yet and I am happy to have more time with Them having your wonderful considerations in mind. Thank you. I do not even know If you see What we write. I hope. Because I really want you to know that your book makes a difference. Dear Plum Johnson, I have just finished reading your book & loved it! I have passed it on to my sister & mother. I have been cleaning out my own clutter, my collections of paper that include notes I wrote from the early days of my children growing up & from phone calls with my children as adults when they had left home, notes about & from my parents & grandparents that I just can’t seem to part with. After reading your wonderful story I have so many more questions to ask my mother & I have so much more I want to share with my children. Love the book & look forward to reading more of your stories. Thank you. I just finished listening to the audio book version and loved it. What an interesting life you all lived. I cracked up when your dad called home from his cruise with your brother and described his trip. I’m so glad I read your book. My parents are aging and I know my siblings and I will be doing the same thing in a much smaller house. I’m not dreading that task any longer. Thank you!